Playing in the sand is fun for all ages! Whether you dig on a beach or at a park, there are plenty of options to build sand castles or to dig for dinosaur bones, with many of these options being free. The Nature & Science Center’s Dino Pit is a favorite for pint-sized explorers. Uncover life-sized fossils, recover them and repeat until your littles are ready to explore the other parts of the Center, including a visit to the animals and a trip to the Trading Counter to identify those “treasures” your family discovered on another outdoor adventure. The Dino Pit can get hot quickly during the summer, so be sure to visit in the mornings. Just up the road from Brushy Creek Park, you’ll find Champion Park, which has a covered sandy area where kids can dig for dinosaur bones, climb on rocks and cool off in the small water features (water play in operation on weekends only). You can either camp or enjoy a day trip at Emma Long Park, which is located on the banks of Lake Austin. Kids can play and splash in the beach area. Note that the park can get crowded on weekends, so arrive early. 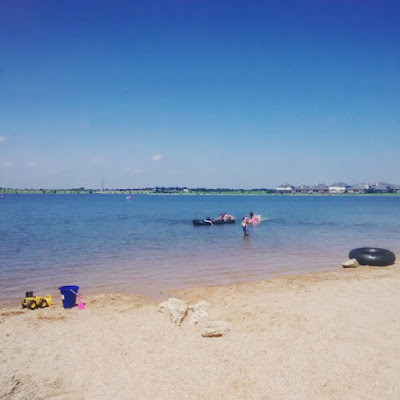 It’s a lake, it’s a community meeting spot and it’s also a beach! Walk along the trail, play on the playground and then cool off in the lake while your kids play in the sand. You can also rent kayaks and paddle boats here as well. In addition to sports fields, a skate park and a BMX racetrack, Northeast Metro has a water play area with a covered sand pit. The area is somewhat hidden in the back of this large park, so it tends to be less crowded than some of the other destinations. 151 N. A W Grimes Blvd. The Play for All Park is truly a special place, with universally-accessible equipment. In addition to playscapes, swings, a pretend town and open space, there is a Sensory Pod/Sand Box where kids can have a blast. Read more about Play for All Abilities Park here. Reimers Ranch is a relatively new addition to the Travis County Park system that is well-known among rock climbing enthusiasts. Take the Beach Trail to access the Pedernales River and its surrounding banks. Don’t have a house on Lake Austin? No sweat, since you can pretend you do at West Lake Beach. The small sand beach is sheltered from the waves from nearby boats. You can also enjoy volleyball, fishing and horseshoes after you are finished splashing in the water. Zilker is one of Austin’s favorite parks, and it’s easy to see why. In addition to nearby Barton Springs, the Austin Nature & Science Center, the Zilker Botanical Garden and the hike and bike trail around Lady Bird Lake, Zilker has a huge playground with plenty of space to dig and play. Read more about Zilker Park here. What’s your favorite way to imagine you are at the beach without leaving Central Texas?